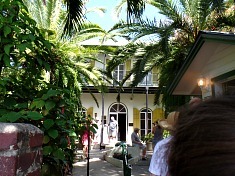 The beautiful Ernest Hemingway house and museum, is located at 907 Whitehead Street near Olivia Street. I's also just a few blocks from bustling Old Town's Duval Street. Out of all the talented, and well-known people who have lived in Key West Florida, Ernest Hemingway is perhaps one of the most flamboyant. Even though he only spent 10 years of his life in the Conch Republic, the years he lived in Key West were productive and happy ones. This was the era of Pauline, his second wife. This is also where he developed long lasting friendships with other notable Key Westers such as Sloppy Joe Russell. During his tenure in Key West FL he developed not only a passionate taste for sportfishing, his fondness for alcohol grew. After writing in his studio above the carriage house, he'd stroll every afternoon to the original location of Sloppy Joes Key West bar. Here he'd spend countless hours ensconced on his stool, drinking and chatting with friends. Key West FL was also pivotal in providing him with character fodder for the classic stories he wrote so well. Many of the characters in his books were based upon local town folk he was acquainted with, or knew well. It was during his time in Key West, that he also received the famous nickname "Papa". This is the name he carried with him through the rest of his life, and is the singular term he was often referred to. The beautiful home you see standing today on Whitehead Street is not what Ernest and Pauline saw in 1931. The home had fallen into ruin, but it still held promise, and eventually Pauline's uncle purchased it for them. Once it was their's, they began a massive reconstruction process that not only focused on renovating the interior and exterior of the home, but the grounds as well. In true "Papa" grandeur, they opted for a rather rare addition that cost them an astounding amount of money. The estimates of the pool construction are reported at being $20,000, which in the 1930's was a considerable sum. Not only was this a costly project reserved for the very wealthy, it was also the only inground pool within 100 miles. This made the Hemingway's and their pool, the talk of the town and the Florida Keys. According to legend, upon hearing the final price, Hemingway jested that they might as well take his last penny as well. 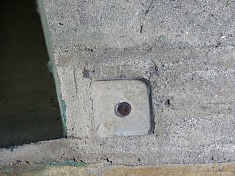 To prove his point, he pressed a penny into the wet concrete at the north end of the pool where visitors are able to view it today. As the decade drew to a close so did his marriage to Pauline. In 1939 he moved to Cuba with his third wife Martha, leaving behind his friends and his life in Key West. "Papa" was always restless, and perhaps that's why he married four times. He also possessed a strong need for adventure, a thirst for travel, and even though Key West was an important part of his life, it's magical spell could only hold him for so long. Uniquely though, the bond between this great writer and this vibrant city continues to this day. You get the unmistakable feel of his presence when you're in his home or walking the grounds. It's as if he never left, and maybe he didn't. When in Old Town it's impossible not to catch 'glimpses' of him. Pictures adorn the walls, posters and various memorabilia abound, and there is the unmistakable essence of Hemingway that seems to linger on the air. 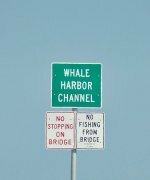 When in Key West FL, you'll quickly discover that there are a multitude of things to see and do. Museums are particularly abundant, but the Ernest Hemingway home is uniquely attributed, and is one you don't want to miss. It possesses a certain punch and flair that capably reflects this famous Key West author's equally flamboyant personality. It's also believed that this partially handicapped accessible museum is a haunted Key West home. Among those who've witnessed his ghostly personage, the consensus is that Papa has returned to Key West. There have been numerous incidences where guests touring the property have reported hearing a typewriter clacking away. Others have reported seeing Papa wave to them from the balcony. 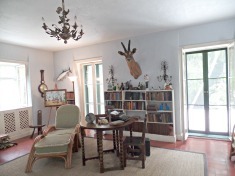 Here, in this beautiful Hemingway home in Key West, not only will you experience a sense of Ernest Hemingway as a writer, you may even temporarily see him. You'll also get a feel for life 'back then'. Of course it's of a life with more pizzazz than most people could afford, but it's still a reflection of the times for those who lived well. 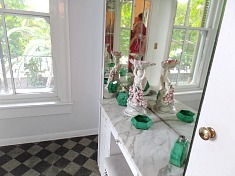 Not only are the grounds a tropical masterpiece, the home of Ernest Hemingway is exquisitely decorated and trimmed out. Plus another unique quality of this Key West museum are the Hemingway cats, which are absolutely everywhere. As soon as you enter the red brick walled grounds of this 'shouldn't miss' Key West museum, you'll feel a certain peace. Perhaps it's the welcoming cool from the shaded gardens that surround you, their heady aroma mingling with the fresh sea air. It may even be the tempting paths that wind through the Hemingway gardens and around the home, beckoning you to follow. 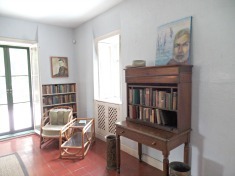 However, it's the beautifully designed home of Ernest Hemingway that provides the greatest sense of awe, offering the heartiest welcome as it draws you near. 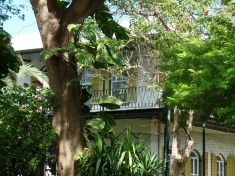 The Ernest Hemingway home is a two storey structure with a wrought iron balcony. The house's shuttered and arched windows adorn the outside, while flooding the interior with natural lighting. Inside, the different room's paneled doors, with their windowed transoms above, help move light throughout the house. From the second storey, whether on the balcony or from inside, you're treated to spectacular views of the Key West lighthouse and portions of Old Town. The soft palette of the walls create a comfortable ambience that pairs with the different pieces and styles throughout. Especially in his gracious bedroom, the ornate, Spanish furnishings work well with the tropical themed pineapple table lamps, and white bedspread. Ensconced on the plush bed are typically one or two of the resident Hemingway cats, curled up, fast asleep. Lighting the rooms are an eclectic mix of glass and porcelain chandeliers along with other unique ceiling light fixtures. The various textures and colors on the floor, range from polished wood to black and white checkerboard patterns, adding character to the different rooms. 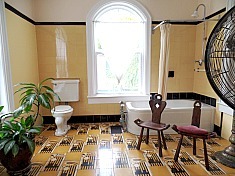 The guest bathroom of the Hemingway house in Key West is finished with large yellow rectangular tiles decorated with fish and bird motifs. This adds a splash of color and whimsy to an otherwise utilitarian space. The smaller square brick red tile, dressed out with an area rug in the Hemingway writing studio above the carriage house, adds a vibrant splash to a man themed space. A room where trophies hang, books nestle on shelves, memorabilia abound, and the famous Hemingway typewriter takes center stage. The 'modern' kitchen with it's double sinks and double ovens was trendy for it's day. 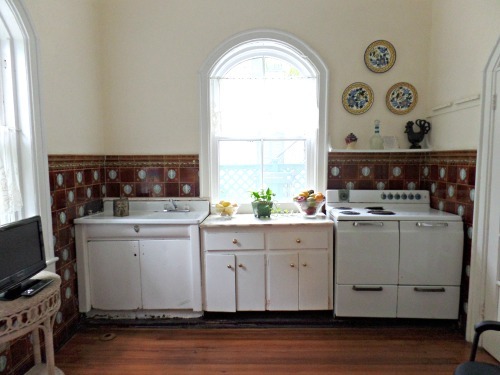 Visitors will note that the work area, snugged between the sinks and oven offers a beautiful view of the yard. The home is almost outdone by the splendid gardens. 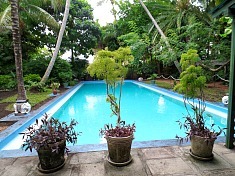 Throughout the grounds an assortment of tropical plants abound. Coconut and date palms, triangle palms and cabbage palms mix with large split leaf philodendron. Massive elephant ears, exquisite bromeliads, banana trees, birds of paradise, drooping chenile plants, sweet smelling plumeria, cacti, bamboo, ruella, pentas, and vibrantly orange Royal Poinciana trees mingle in a riot of color and texture. In shady corners, lily ponds bloom, with a small wooden bridge providing access over a pond. Mosaic tile, cobblestones, pavers, concrete blocks and other mediums create a multitude of welcoming paths through the grounds. Small benches tucked into shady areas, dot the landscape and offer a quiet place to pause, reflect and relax. Water fountains add to the romance of the Hemingway gardens, and the famous long and somewhat narrow pool, is a centerpiece of the grounds. The six toed cats, the inheritors of this property are everywhere, protected by an invisible fence. They are in the trees, on the roof, in the shade of the gardens, in the house on the beds, furniture, tables and bookcases. 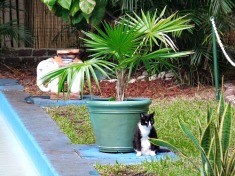 You'll find Hemingway cats drinking out of the pool, and the water fountains. They even have their own fountain which is made out of two unusual, and interesting pieces. 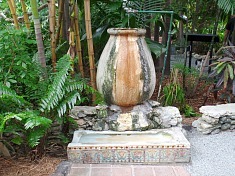 The top portion is crafted out of an old Spanish olive jar from Cuba, while the fountain's base is an old tiled urinal from Sloppy Joe's Key West bar. 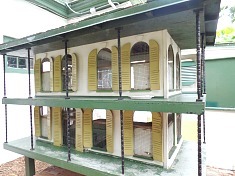 Small kitty houses are tucked into shaded garden areas, and a large kitty condo designed to match the exterior of the Ernest Hemingway home, provides additional protection and comfort. 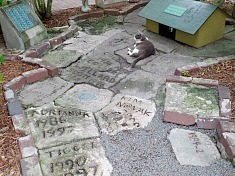 A Hemingway cat cemetery is also on the property. Here the names and dates of those who have gone ahead are engraved on crosses, headstones, and concrete wedges, forming a mosaic of memory and tribute. Whether you're in this gracious Key West museum walking through the rooms admiring the beautiful period pieces, or strolling the grounds, close your eyes, step back in time, and picture his life here. You can hear his wife's laughter, and see Snow White, he and his sons beloved polydactyl cat, basking in a sunny corner of the garden. If you listen carefully, you can imagine the rhythmic sound of his typewriter clicking away. However, if it's an "active" day, you may not have to pretend. You may be quite astonished to actually hear the resounding clack of his typewriter hard at work. You may even spot his "personage" on the property. Not only are the memories and quite possibly ghostly presence of Ernest Hemingway alive here, so are Snowball's progeny. Today, the grounds are home to approximately 50 Key West cats, many of which are direct descendants of his furry companion and who also carry the unusual polydactyl 6 toe trait. 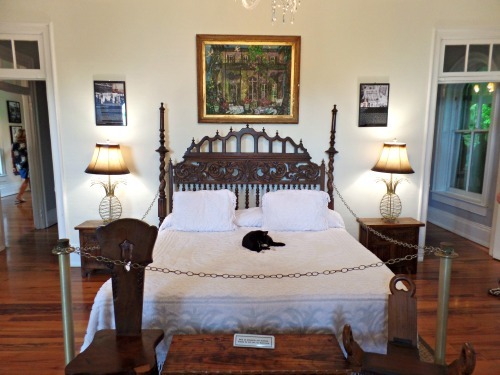 The home of Ernest Hemingway is one of the more beautiful Key West museums, and when you visit, you'll find that much of this famous writer is still present. 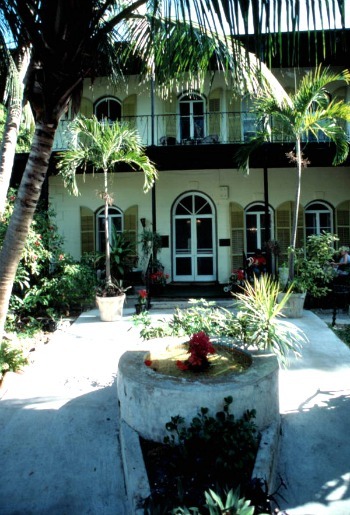 Walking the grounds and touring this Key West museum, you'll have a sense of someone great. An individual who lived large, gave back much, and later died an untimely death by his own hand. 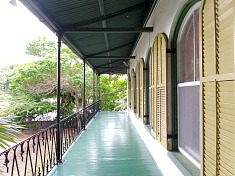 This popular Key West museum is open 365 days a year from 9 - 5 and the entrance price includes a 30 minute guided tour. If you buy your tickets at the door you'll likely have to stand in line to purchase the tickets. Most people travel to Key West FL during the winter months, which is peak season. This means you'll often experience fairly long line ups. However, since they have STOPPED accepting credit cards, and now ONLY ACCEPT cash or advance purchased online tickets, the lineups have become less of a challenge. Especially when on vacation I like to save money, and you may want to do like I do, and buy your tickets online in advance. This means I can use my credit card, making my purchase at home, instead of carrying extra cash to buy tickets while I'm there. I suggest you take advantage of the great savings available through a reputable national company called Trusted Tours. They're an affiliate I highly recommend, and you'll find that through them, you'll be able to spend less and do more - lots more. If you're going to be in the Conch Republic you'll be visiting at least several Key West museums. You'll also likely go on a variety of other tours and participate in a number of different activities. All of these events cost money, and through Trusted Tours, your savings can vary from as little as $1.50 to close to $30.00 an adult ticket depending on which activity, tour or event you're on. By taking advantage of the online purchases through Trusted Tours you'll find the savings you incur will make it possible for you to see and do more, for a whole lot less. Their online advanced rate gives you a discount on your entrance to the home of Ernest Hemingway and combines it with discounted entrances to other popular Key West attractions. 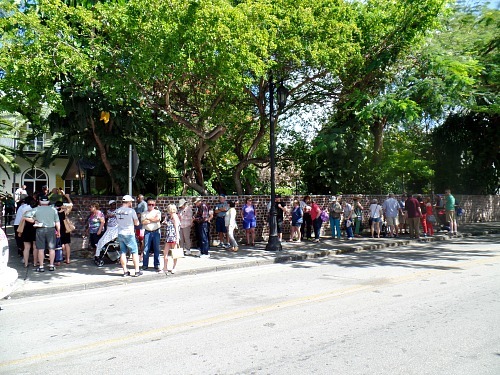 The Local Legends Combo Ticket is one of the more popular ways to go as you'll gain discounted admission to the Hemingway Home, The Truman White House and the Mel Fisher Maritime Museum. You also have the option of selection 1 of the 3 different Trusted Tour packages that feature Ernest Hemingway's home as part of their combo packages. One very popular combination is the Hemingway - Old Town Trolley package which is a lot of fun. It orientates you to the area, it's informative, and it has a convenient hop on - hop off service. Another Hemingway combination package you might be interested in is the Hemingway - Mel Fisher Maritime Museum package. 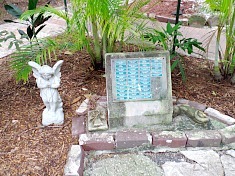 The third combo is the Hemingway - Key West Butterfly Museum package. On any of these combo packages you'll end up saving money over purchasing the tickets for each venue individually. By buying your e-tickets in advance, you're also saving money over the "at the door" price. It's simply a matter of which combination ticket interests you the most. The important thing is that you're maximizing your Florida Keys vacation dollars to the fullest! No matter how you look at it, buying these e-tickets now will save money.